OUTER BAND: All PM Discs use a stainless steel outer band. PM utilizes a high grade 420 stainless that will not gaul or squeal like lesser quality discs. The newest version PM outer bands can be removed and replaced once worn. 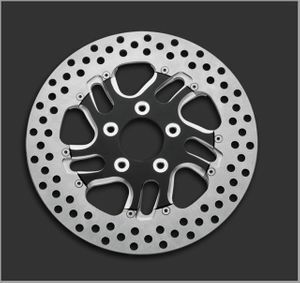 DISC CARRIER: All PM Image Discs use a machined aluminum carrier. 11.5" & 300mm discs are bolted to the outer band and 13" discs are attached via floating elements. The carrier is perfectly matched to its respective wheel and will have a bolt pattern specific to the front or rear.